We closed on our house around Memorial Day last year and moved the weekend of June 30 to July 1. Some of you may remember this weekend as The Derecho Event. That’s right- we moved during a line of severe thunderstorms that came in one right after the other. The power went out the first night. 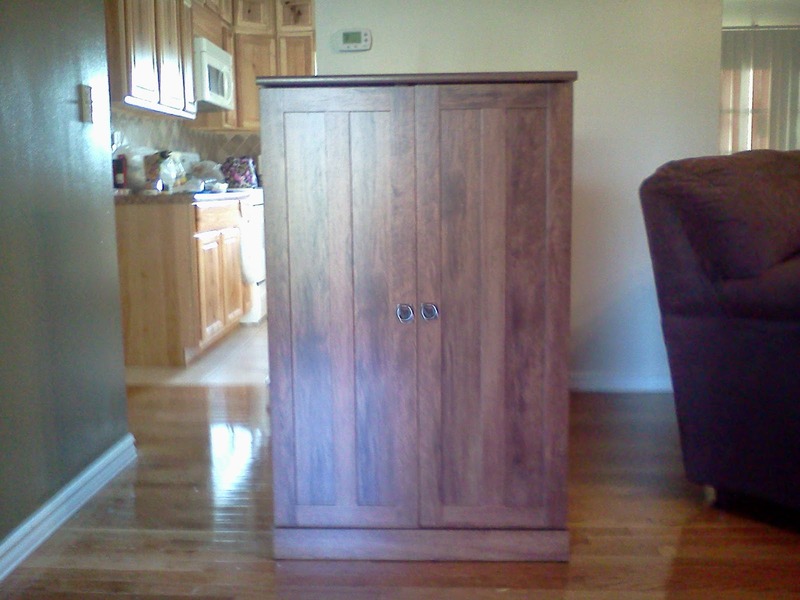 We had moved all of our large furniture, but were still making back and forth trips from our old house moving all of the other stuff, with the help of my mom. We actually had a hard time getting back to our old house due to downed trees on the two lane roads around our house. 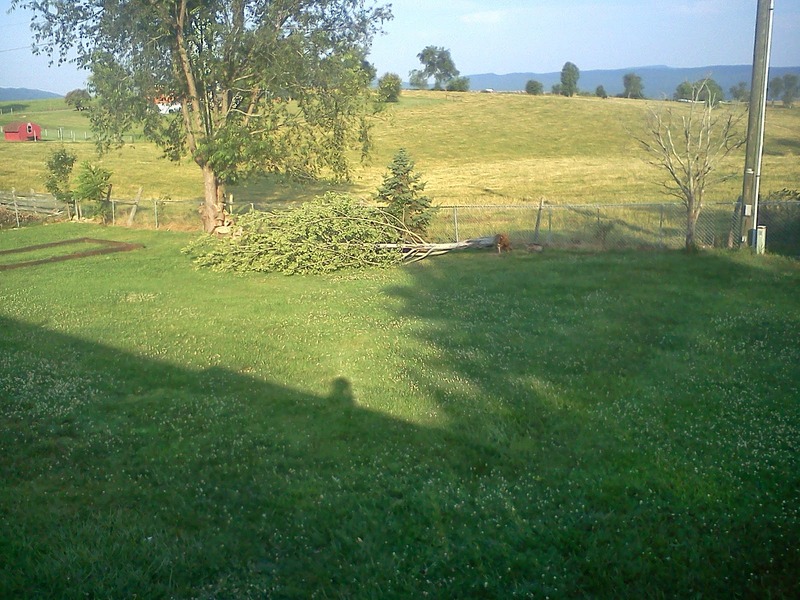 Trees also came down at our new house. The worst part: our old house still had power, but the new one didn’t. However, the new house was where our bed and the majority of our stuff was. It was quite an experience. The power stayed out for the next 6-7 days and it reached 100 degrees on most of those days. Barry’s parents brought us their generator on the second night without power, so we were able to save our chest freezer and fridge full of food. We were also able to run a window AC unit and charge our cell phones. 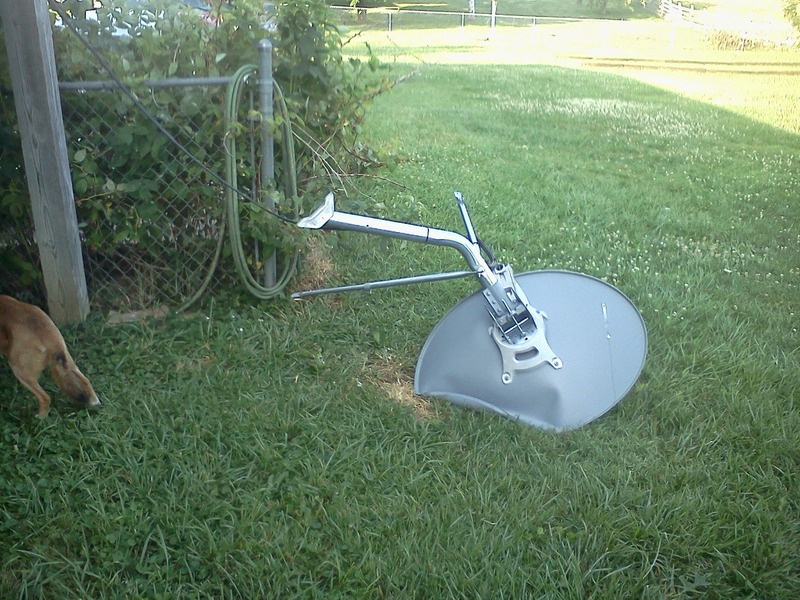 Luckily we didn’t intend to use this satellite dish. It was left by the previous owners. We also had a branch from the tree in our front yard come down, and to this day it still has a gaping hole in the middle. 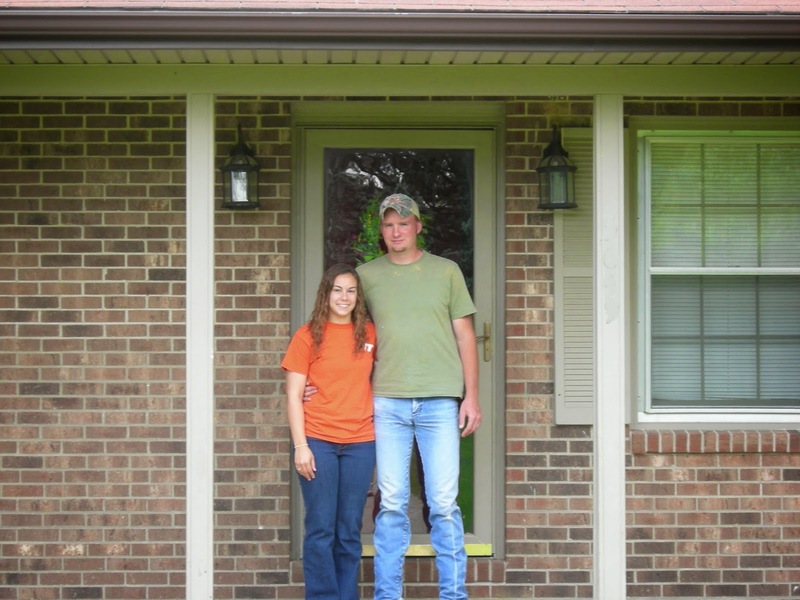 Once we got through that first week, we focused on settling in to our new house. 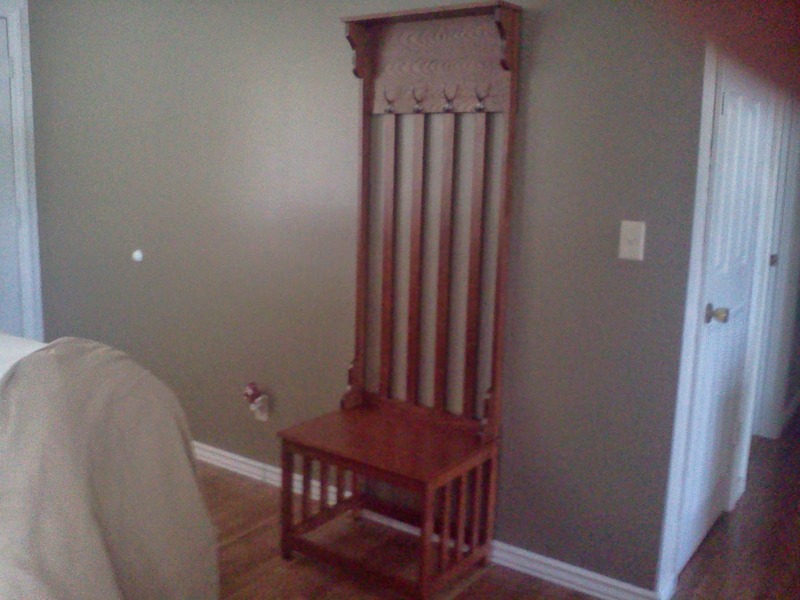 We bought new living room furniture and I learned how to put together many things, including a DVD cabinet, a hall tree, and rocking chairs. I put all three of those together with little to no help from Barry. A proud moment for me (after the frustration passed). Over this past year we have done many projects. 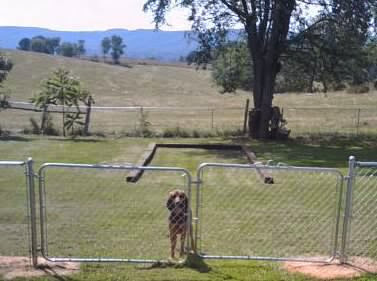 Prior to moving in we painted the entire main level, had a heat pump installed, and Barry and his friend installed a chain link fence around the backyard to keep the dogs in. My Dad built us a landing and steps off of our deck that would go into the fenced in yard. 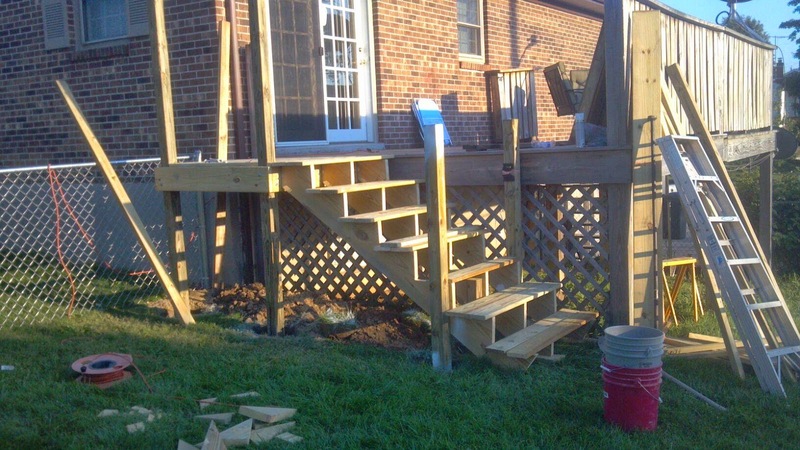 Previously the deck only had a rickety stairway that went into the driveway. 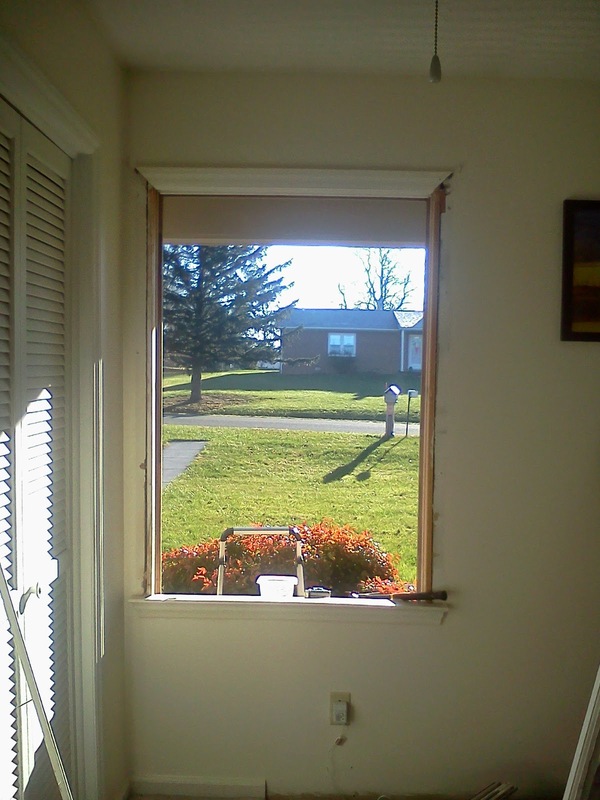 Thanksgiving was spent installing four new windows across the front of the house with the help of my Dad. He came back in April and helped us do the other two that were left (the previous owners had done the other 3 on the main level already). We kept losing shingles from our roof anytime we had strong winds, so this spring we decided to have a new roof installed. We went with a metal roof, which will hold up better to the weather and the way the wind comes in. It seems like we’ve done so much in the course of a year, but I’ve learned that the projects never stop with home ownership. In the future we are hoping to replace our garage door, paint the porch, and build some steps to connect the driveway to the porch. Barry is going to get some good use out of that leather tool belt I got him for our anniversary! How long have you lived where you currently live? What do you live in? House? Apartment? Yurt? Did I post here before? I feel like I tried to but I might not have actually hit the publish button. Congrats on living in your home for a year. I love all your land and am very jealous of your view. I love rolling green hills. My living situation is way too difficult to explain right now! Congrats on one year in your home!!! We’ve lived in our current house for ten years. It’s the only house we haven’t built, so we had several projects when we moved in to get it to our tastes. It was fun though, because I love doing that kind of stuff! We were on our way to a funeral in Connecticut when the derecho came through. I was bored in the car and just happened to look at my weather bug app and saw the storms coming. I called the boys and had them bring in the flag and loose stuff on the deck. 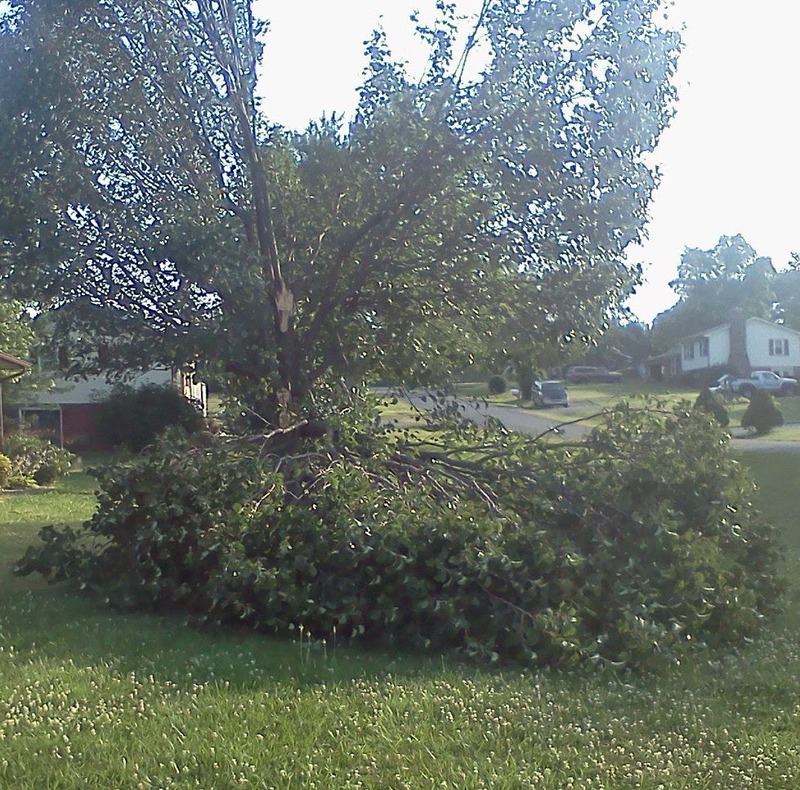 We got really lucky and had very little damage despite having a backyard with a lot of very large old trees. I doubt if I had been home if I would have been aware of the storms coming our way! I’m a weather buff so I was disappointed that I wasn’t at home to experience it! That’s really neat that y’all have always built in the past. If we ever move out of our current house, it will be because we found some land and built our next house. Like you I had no idea those storms were coming in! It was crazy how they came in one after the other all weekend long. I’m glad your boys were home to bring in the flag and the loose stuff. It probably would have gotten blown to Maryland, otherwise! Congrats on the 1 year!!! I always feel like the home improvement projects never stop, but it looks like you guys are doing some really great ones! We just moved into a new apartment (rent) and really like the location a lot better. Since we’re only going to be in DC probably another 3-4 years, we decided to just rent and buy a house whenever we move (hopefully back to Colorado). My parents flip houses as a side-project for fun, so I’m slowly acquiring all the skills I will need someday for my own, ha. A few months ago we learned how to tile a back splash from my mom. That is so crazy you guys moved during those storms!! I’m glad you were able to get a generator, though! That sounds like a big side-project! When you mentioned skills I immediately thought of Napoleon Dynamite and his ‘skills’.